Photos include a version built high in the Colorado Rockies and the interior of the original house, featured in a 1983 Popular Science article that coined the term Little Big House, is pictured below. It was built in 1981 for $35,000 in Monterey, Mass. Many others, with variations, have been built throughout the US and Canada since. It has proven to be a very popular house, not only for its economy of construction but also for the spatial quality of the interior. 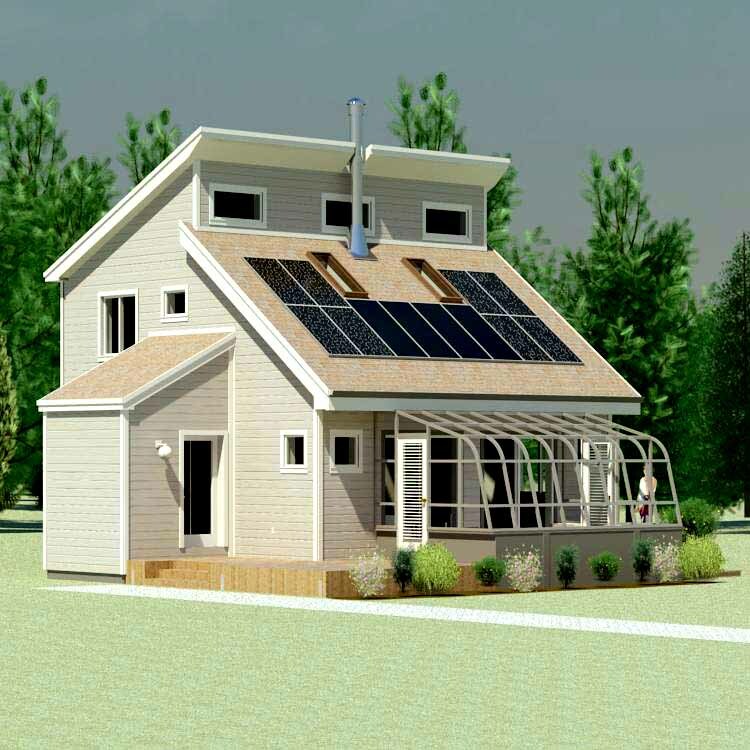 At the same time, it is an economical house to operate because of the energy efficient design, which incorporates passive solar design elements as well as the active solar collector features built into the greenhouse. "The greenhouse, with its integral rock-bed heat storage, is sized to provide a substantial amount of the home's space-heating needs. A Thermostatically controlled fan blows hot air from the greenhouse peak onto the rocks under the floor slab. Concrete blocks laid on their sides form the air plenums in the rock bed. At night the process is reversed to maintain greenhouse temperatures. 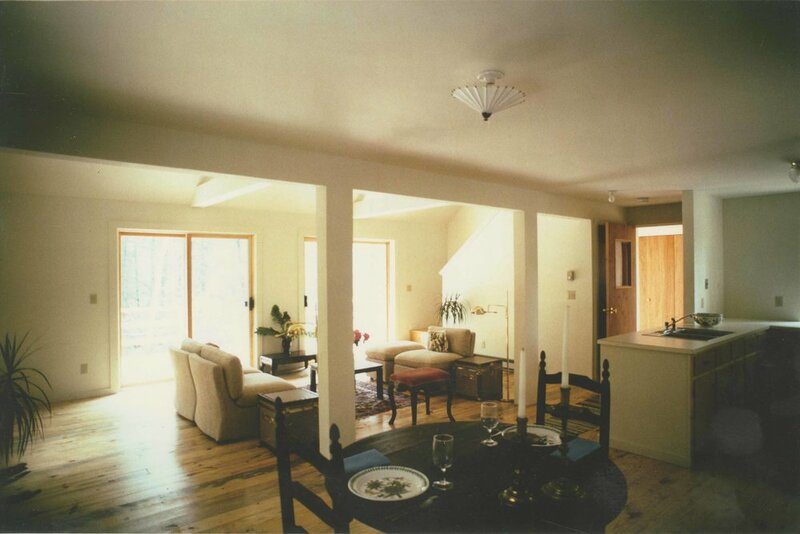 An airtight wood stove in the living room handles most auxiliary-heats. Electric baseboard heaters are installed as backups but are rarely used. In fact, the owner reports that electric bills average $29 a month". "It's just a little house in the woods in western Massachusetts. 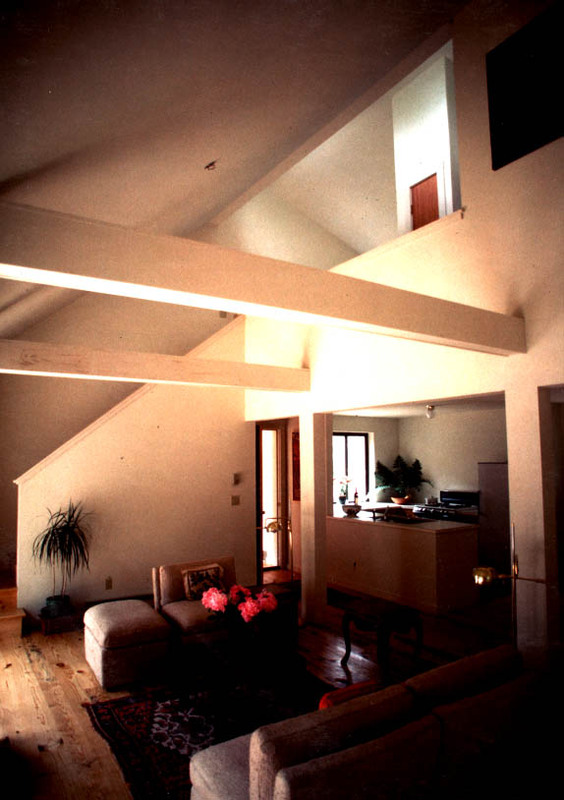 In fact, the house measures a mere 24 feet square. 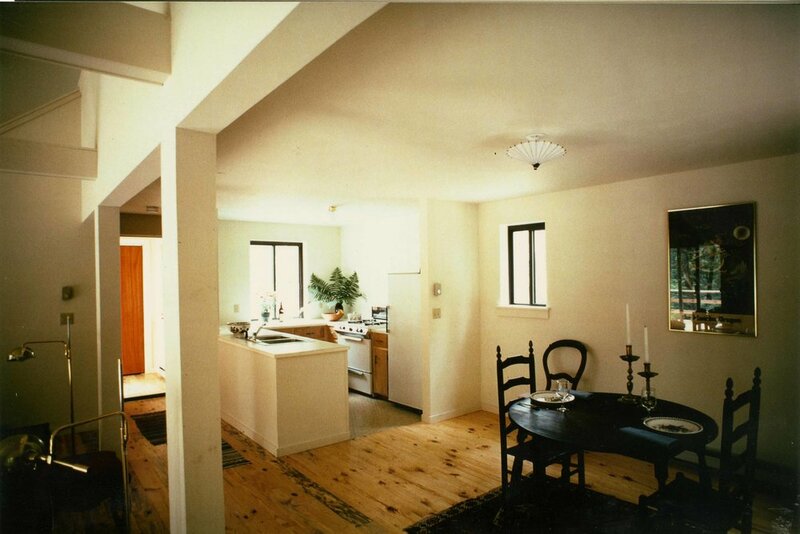 Inside, however, a sense of spaciousness belies its compact outside dimensions. The key is a soaring cathedral ceiling that opens up the ground floor. John Fülöp's tiny solar home can be built two ways. With an open-air deck on the south side, it's a direct gain solar dwelling with sunlight heating the living space via a pair of sliding glass doors. With a prefab greenhouse and rock-bed storage added in place of the deck, it's an indirect-gain solar home. Either way you have an unusually affordable home: The Architect designed this house to keep costs low by basing dimensions on standard construction materials and stacking plumbing runs". "Thanks so much for being such an integral part of our dream come true. The house is a real blessing - calling forth a new cycle of growth for us. Since we moved in we have all been stretching and opening new possibilities in our lives. In other words, this house has a soul! It calls us forth into a blessed new year. Thank you again for your vision, heart and generosity."